In short: A luxurious compact sport sedan. Not only does the brand with the three pointed stars have a winner with rookie sensation Lewis Hamilton on the Formula One circuit, but we think the new C-Class deserves a podium, too. On a recent drive through the majestic back roads of Portland, Oregon, whether on straights along the Columbia River, bends during ascension of volcanoes or in city traffic, the new generation Mercedes-Benz C300 behaved like a true charmer. It certainly seduced us, the drivers, passengers and curious onlookers. As if the previous generation were not captivating enough, especially with attractive financing terms, this fourth edition is sure to capture a wide audience and deliver some sales records for the brand in the process. What’s new, you may ask? In a nutshell, much more for the money. 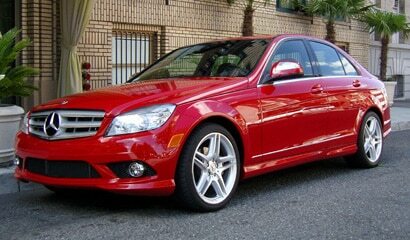 The entry level car is actually playing catch-up to the company’s flagship, the S-Class. Its design is more in line with the big car, with sporty and dynamic looks. It is larger (4 inches longer) and therefore more roomy all-around than its predecessor. 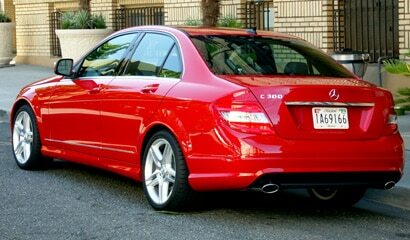 The C300 is quite a satisfying car as is, offering more value, safety (see sidebar), room, features and dynamic behavior. Also, in these days of environmental consciousness, it will deliver more power and use the same amount of gasoline (or less) than the outgoing version. Our “Sport” tester had some AMG-inspired dynamic components. We’re talking mega-wheels (optional 18 inch), a three-prong steering wheel, a sport braking system, dual exhaust, body styling and a huge integrated star logo in the three-louvered grille. The interior was black leather with aluminum trim finish and the exterior had a redoubtable flashy red that contrasted nicely with the snows of Mt. Hood. It is also 15 millimeters lower than the classic car. There is a manual option, but our 7-speed automatic gave us a good feel. We noticed the huge exterior mirrors, and rear passengers will appreciate all that extra space, especially with an upgraded hydro-mechanical rear suspension. Let’s not forget the convenient Bluetooth connectivity, dual-zone climatic control with charcoal filter, power sunroof, 8-way power front seats with lumbar support and the relatively user-friendly central controller for clutter reduction, which all come as standard equipment. In the audio department you will do fine with the standard equipment but it might not be bad to treat yourself to the Multimedia Package. For an extra $2,700, you get COMAND Navigation featuring a 7-inch power retractable screen with attractive graphics, a 30 GB hard drive, in-dash 6-disc DVD-Changer (yes, you can watch movies in the parking lot, or if you’ve been banned from the living room), 450-watt Harman Kardon LOGIC7 surround sound system with 12 speakers, PCMCIA slot and voice control. For those addicted to the ever-present all-wheel drive option, rest assured that the 4-Matic will be offered. And yes, there is a beefier V6 with 40hp more if you really have to have it. 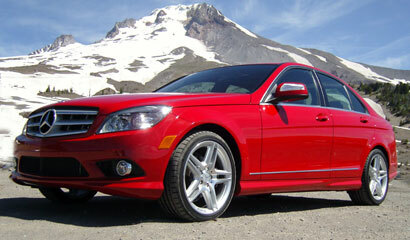 Read a review of the Mercedes Benz C350.